Hungry and vegetarian in Warsaw? Go to Greenway to get your dose of vegetarian goodness. It is cheap and the food is pretty good. Eating vegetarian is becoming easier in Warsaw but it still has a long way to go, especially on a budget. As a bonus, Greenway is a Polish chain so you can find it in quite a few polish cities. I'm a big fan of the interior of this cafe and came back to take more photo of it. I love the mix of danish modern vintage with fresh shabby chic-esque design in the front of the cafe. Getting married? Head to Bazar Rozyckiego. Bazar Rozyckiego is the iconic Praga market. It is located in the heart of Praga and mainly sells attire for formal occasions-- wedding dresses, suits and christening outfits. It's worth it to visit because it has a specific atmosphere you can only find in Praga and you feel like you are in some sort of time warp. Also, it is being torn down in the near future so it won't be there for long. best pierogi in warsaw period. The best pierogi, quality and price both taken in for consideration, can be found at Pierogarnia na Bednarskiej. They have endless meat and vegetarian options and dessert pierogi that I thought could only be found in my dreams. The blueberry pierogi with the cream sauce (not sugary) are absolutely fantastic. And this place isn't a restaurant, more like an upscale milk bar so prices are pretty good too. If you go, go early. They usually run out of pierogi by the early evening. The bears at the zoo in Warsaw are famous. What is unique about them is that they are on the outside of the Warsaw Zoo just two blocks away from the main square in Praga. Walking down the sidewalk, you pass by their habitat which seems, at first, alarming because it seems to exposed to the public. But once you get closer, you see that the bears are separated from the railing by a big wall and deep moat which apparently keeps them from getting out. Take tram 4 from the center to Praga. Once you go past the bridge, look the left, you will see a park and the bears. Get off at the first stop after the bridge. Now that there has been an on-going heat wave in Warsaw, people are looking for ways to escape. Most people do not have air conditioning in their homes because it wasn't really necessary as there often weren't heat waves here in the past. If people can't escape to the beach or to a lake, shopping malls are a common place of escape. 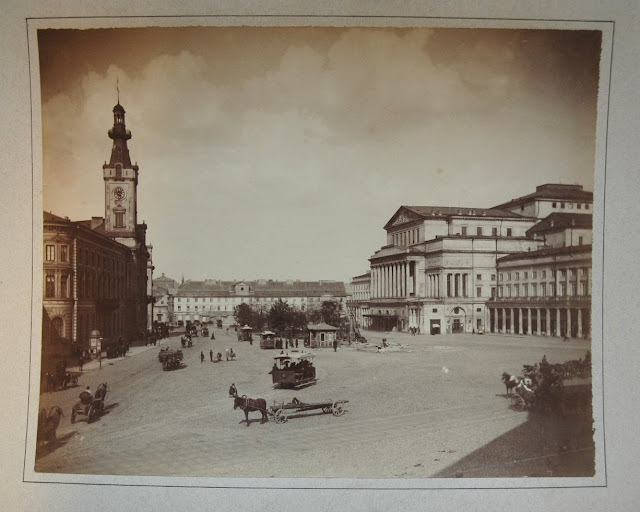 The Warsaw Diaries has yet to have highlighted malls in Warsaw as they are a recent phenomenon. Unlike in North America, malls came to Poland in the late 90's and the more modern ones were built after 2000. The one pictured here, Zloty Tarasy, was built only a few years ago next to the train station. My local friends loathe the place but it is always packed. Interesting things to point out is the mix of Polish and foreign brands, few low end shops and a lot of middle to high end shops and a lot of British brands, especially those for young women like Top Shop. Mostly, I am curious as to who is shopping, who is paying for it because prices here are very high in comparison to average salary of an educated person. For example, Zara marks up its products about 20% more than in Western Europe. Why? I'm not sure but one guess is because they can. Demand is high and selection in Poland is much less than in Western Europe. My friends, Marta and Barti, are getting married this September and I love their wedding invitation! They asked their friend to design their cards-- he drew them as a queen and king and added a great design detail of the same print that is on the back of a playing card. In Powisle just from the side of the bridge by the city gates near the river, you can catch a glimpse of a hidden secret garden. It is a community rose garden open to everyone if you just can find it.. There is currently a heat wave in Poland and, without air conditioning, it is unbearable to stay in the city. To escape the heat, the warsaw diaries went to the Park Kultury in Powsin to one of the city's open air pools. It is a bit old school (although I adore the mushroom inspired trashcans) and there are only 2 small pools but the pools are in the middle of the Kabaty forest on the outskirts of Warsaw--- it is really a lovely setting. The entrance is 10 zloty and 8 zloty for students. To get there, take bus 519 to the very end of the line. Strawberry time is over but now it is time for raspberries, chantrelles, and red currant. If you drive outside of Warsaw, you can see people lining the road selling these goodies. Yum! The University of Warsaw's botanical gardens are an oasis in the city. They have several different areas as to the type of plants and glassed in rooms with tropical plants. The entrance is very inexpensive (around 2.50 zloty per adult with many different kinds of discounts offered) and it is located centrally next to the Lazienki park.